A wonderful team goal finished by Jack Midson helped Conference play-off chasers Eastleigh beat Lincoln City. Neat one-touch build up ended with Ben Strevens flicking the ball through for Midson to poke home from eight yards. The hosts equalised after the break when Ben Tomlinson finished from close range. Parity was short-lived as Midson crossed for veteran Craig McAllister to put the visitors back in front just three minutes later. 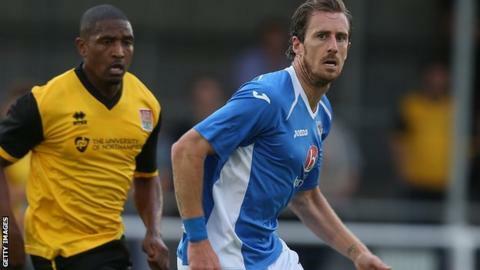 Regardless of other results, a win at home against Kidderminster next Saturday will guarantee Eastleigh's place in the play-offs. Lincoln, who have now won just one of their last eight matches, end the season at struggling Dartford. "Without the ball we weren't up to the task today. They didn't do anything that was groundbreaking, they got the ball forward early and we needed to stay with runners and make things difficult for the opposition but we didn't do that, we've made it pretty easy for them I think. "The organisation among the players wasn't there today for whatever reason. It's disappointing, especially at home because we've got a good group of fans who back us a lot but we haven't repaid that faith they've put in us. "It's not just ability, it's character and we've got to make sure that runs like this don't go on. If players are playing for their future at this club or another they've got to make sure their performances are up to standard. "If we can get players to improve the squad then we will do that." "I think that's the most important three points of the season to date. "We'd have all settled for a point prior to today, but the lads were fantastic. "I'm just disappointed with the goal we gave away, we didn't defend it well enough." Match ends, Lincoln City 1, Eastleigh 2. Second Half ends, Lincoln City 1, Eastleigh 2. Offside, Lincoln City. Connor Robinson tries a through ball, but Connor Robinson is caught offside. Attempt missed. Jon Nolan (Lincoln City) right footed shot from the right side of the box misses to the right. Substitution, Eastleigh. Deon Burton replaces Jack Midson. Attempt missed. Brian Howard (Eastleigh) right footed shot from outside the box misses to the right. Attempt missed. Ben Strevens (Eastleigh) right footed shot from outside the box is too high. Attempt missed. Hamza Bencherif (Lincoln City) header from the centre of the box misses to the left. Attempt saved. Hamza Bencherif (Lincoln City) header from the centre of the box is saved. Substitution, Eastleigh. Brian Howard replaces Craig McAllister. Goal! Lincoln City 1, Eastleigh 2. Craig McAllister (Eastleigh) right footed shot from the centre of the box to the centre of the goal. Assisted by Jack Midson with a cross. Goal! Lincoln City 1, Eastleigh 1. Ben Tomlinson (Lincoln City) right footed shot from the right side of the six yard box to the bottom right corner. Substitution, Lincoln City. Jon Nolan replaces Kegan Everington. Substitution, Lincoln City. Connor Robinson replaces Kieran Wallace. Substitution, Eastleigh. Craig Stanley replaces Harry Pell. Second Half begins Lincoln City 0, Eastleigh 1. First Half ends, Lincoln City 0, Eastleigh 1.